In August 2016, Annabel Florence returned from a trip to Greece where she undertook a Postgraduate Epigraphy Course with the British School at Athens. A student in the School of Historical and Philosophical Inquiry, Annabel was able to undertake this travel with a Graduate School International Travel Award. 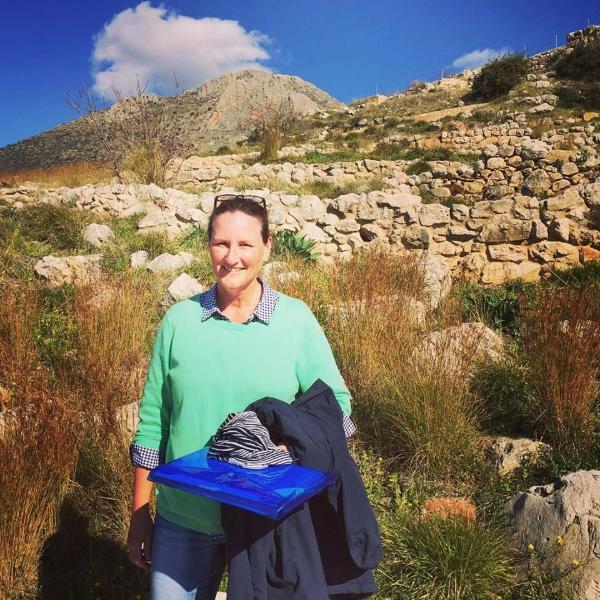 Below, Annabel talks about what she did on the Epigraphy Course, and how the experience and connections she made in Athens will continue to benefit her now that she has returnd to Australia. Annabel's story highlights the diversity of international experiences possible with a GSITA. There is no doubt that the GSITA has enhanced the quality of my thesis and has helped me develop additional skills for my post-doctoral career. Being able to participate in the BSA’s postgraduate epigraphy course has given me the ability to understand the complex and extensive processes involved in reading, interpreting and creating an edition of a Greek inscription, to trace the bibliographic trail of an inscription back to its first sighting, and to understand the value of the topographical and archaeological context of an inscription’s stone.This knowledge has given me the ability to look at my thesis from new angles, and to use epigraphic evidence more effectively to open up fresh avenues of evidence gathering that will strengthen my arguments. To the right is a photo of ancient Athenian boundary marker (horos) complete with its inscription found after a long day's search in 40 degree heat on the rugged scrub-covered slopes of Mt. Hymettos in Athens. By staying at the British School I was also able to access its extensive library, as well as the Blegen and Gennadius libraries of the American School. With regards to my post-doctoral career, the course has provided me with epigraphic skills that few ancient historians have. Additionally, it has enhanced my editorial and research skills, and strengthened my Greek and Latin language skills. Only fourteen participants from around the world are selected for this highly competitive course each year. Consequently, I was able to establish solid working relationships with elite students from Harvard, Cambridge, Durham, Frankfurt and Universities of Chicago, California, Edinburgh, Exeter and Manchester. Since returning to Australia I have had follow up contact with six students from the course, as well as with the course co-ordinator Robert Pitt. I hope to continue autopsying inscriptions in the future with the aim of publishing my editions at some point. I intend to incorporate what I have learned on the course into my tutorial teaching.